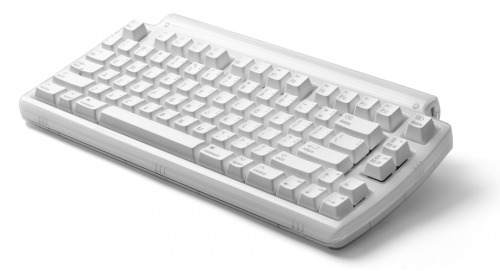 Based on our award-winning Tactile Pro keyboard, the Mini Tactile Pro is smaller, and also built from the same premium ALPS clicky keyswitch technology that Apple used in its original Apple Extended Keyboard — widely viewed as the best keyboard Apple ever made. More free space on your desk: Using your mouse is more comfortable — because you don't have to move your hand so far. Easy to pack for trips: If you loathe your laptop's built-in keyboard, the Mini Tactile Pro is narrow enough to fit in your laptop bag. Mac-friendly function keys: Just like an Apple keyboard, the Mini Tactile Pro’s function keys let you control screen brightness, volume, iTunes, and more. There's even an Fn key, that lets you momentarily change the function keys back to their traditional duties, when you need them. € £ © are easy to find: Extra handy (but hard to remember) symbols are printed right on the keys. Simply hold down the Option key for the bottom-right characters, or Shift-Option for top-right characters. Laser etched keys: All those symbols are handy, but what happens when they wear off? They won't. They're laser etched — burned into the keys with a laser — so they'll never wear off. 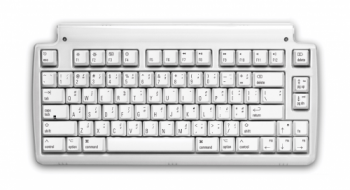 Sculpted keytops: The latest trend in keyboards is to have very flat & wide keys, with little or no space between them. You see this a lot on laptops and netbooks. While they look great, they can also be a little tricky to type on. The flatness makes it very easy to slide out of home row and lose your bearings. The Mini Tactile Pro bucks this trend. It has traditional sculpted keytops, curved to fit your fingertips, and keep you from sliding out of home position. 3 extra USB 2.0 ports: Some keyboards have 2 USB ports — most have none. We’re giving you three! You can plug in flash drives, digital cameras, your mouse, and more. Plug in your USB devices. Detachable keyboard cable + a spare: If you plan to take your Mini Tactile Pro with you, we've made that easier to do. Keyboard and cable detach from each other, and we provide an extra cable that you can keep stowed in your laptop bag, for use on the road. No ghost in this machine: Most keyboards allow only a few keys to be pressed at once, so they can't keep up with very fast typists. The result is called ghosting — letters missing from what you actually typed, or additional letters that you didn't type. The Mini Tactile Pro has special Anti-Ghosting Circuitry (also called n-key rollover) to eliminate these problems. 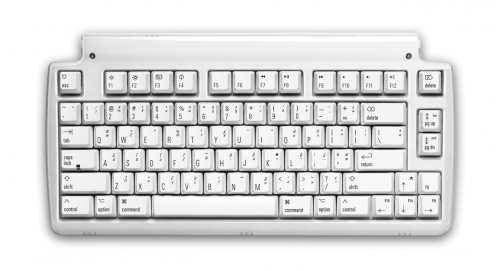 You can type as fast as you're able; the Mini Tactile Pro will keep up.